If you don't own or lease a car, chances are you also don't have health insurance. Here are some ways I protect myself when it comes to car rentals. A lot of people I know don’t own cars. Usually, that means they’re also not carrying auto insurance, which makes it interesting when you want to rent a car. Who is responsible if the vehicle is damaged or stolen? What if the damage is your fault? Even worse, what if you hurt somebody or destroy their property in the process? By the time you read this, I’ll be headed to California for a much needed week off. And every time I travel, I run into the problem of renting a car with no car insurance. Car culture is so embedded in the United States that most people can’t fathom not owning one. Yet, I haven’t owned one of those wealth destroying contraptions in nearly nine years! So what do you do if you rent a car but don’t have car insurance? Most people seem to rely on a combination of auto insurance provided by the rental company or the protection that comes with using credit cards. But I’ve always wondered if the coverage is “good enough.” Once you’ve built some wealth and have assets at stake, the last thing you want to do is expose yourself to liability that could lead to losses. So, I did some research and put together the below summary of the how I insure against catastrophe when renting a car. Hurting yourself should be covered by health insurance and disability insurance. The health insurance pays the doctors to put you back together. The disability insurance includes the loss of income while you’re not working. As long as you have both, you should be covered on the health expense and income protections side of the equation. That makes this the shortest part of the summary, but you need these protections in life generally, since there’s a lot more in life than a car accident that could cause high health expenses or disrupt your ability to earn money. But what happens if you damage the car? Damage to the vehicle, while unpleasant, may be the least of your worries. Cars aren’t cheap but rental cars also aren’t luxury cars and the value of the car is fixed. If you total the car, you’ll need to replace it. If you sideswipe a vehicle, you’ll have to pay a body shop to fix the problem. That makes sense and seems reasonable to quantify. Worst case scenario involving destruction of the rental car, you’d think damages would be $50,000 or less. But what about “loss of use”? Loss of use is the charge that a rental car company will try to recoup from you for lost rental profits while the car is sitting in the shop or on order while they’re replacing it with a new car. To protect yourself from damage to the vehicle and “loss of use”, car rental companies will sell you CDW, or Collision Damage Waiver, (sometimes called LDW, or Loss Damage Waiver). It seems that agents are trained to make this as confusing as possible and to convince you that it’s a non-negotiable item. Chances are good that you don’t need it. First, if you have personal auto insurance, it’s likely that it covers your rental car up to the same limits as it does for your car. However, if you don’t have car insurance (like me), you’ll need to rely on your credit card coverage. Your credit card likely includes coverage for damage to the car. This coverage is typically secondary to any personal auto insurance you have (your “primary” insurance) but, if you don’t have primary insurance, the credit card coverage is your primary insurance. The trick is making sure your credit car rental insurance covers “loss of use” fees. c. the purchase invoice price of the Rental Vehicle, minus salvage and depreciation costs. Reasonable and necessary charges related to the Rental Vehicle subsequent to the Damage or Theft, such as Loss of Use, appraisal fees provided they are supported with verifiable documentation, towing charges (which are not covered by other roadside assistance programs available to the Card Member) and storage, which are charged by the nearest vendor or facility capable of rendering assistance and which are usual and customary in the locale where the Damage or Theft occurred. Although the credit card includes “loss of use,” I’ve read that it’s possible to get caught in the crossfire between credit card companies and car rental companies. The car rental company will come after you for the damages and loss of use. Naturally, your credit card company will ask for rental companies to prove the loss of use (i.e. “show me your rental logs to prove that every other car was rented out during this time such that you actually suffered damages.”) Car rental companies don’t like turning over these records, so it’s possible to get caught in a situation where the car rental company is charging you for a “loss of use” while your insurer is refusing to pay for it because of the lack of proof. American Express also offers a Premium Rental Car Rental Protection program. If you enroll in the program and rent a car using your American Express, you’ll automatically be charged either $19.95 or $24.95 for the entire rental, which covers you up to 42 days of a consecutive rental. Up to $100,000 of primary coverage for damage or theft of a Rental Vehicle. Up to $100,000 of Accidental Death or Dismemberment coverage ($250,000 for California Residents). Up to $15,000 for secondary medical expenses per person. Up to $5,000 for secondary personal property coverage ($15,000 for Florida Residents). Coverage is also primary even if you have personal car insurance. For me, the extra coverage seems worth it for a small $24.95 charge. It’s certainly significantly cheaper than the $10-$30 each day that you’ll pay for CDW (or LDW) coverage from the rental company. When I rent a car, I typically use my American Express and this premium rental car protection. What about some of the other major credit cards? For Chase, you’ll need to find the Guide to Benefits for your card. I suggest googling the name of your card plus the words “guide to benefits” to find it. I found the Guide to Benefits for the Chase Sapphire Reserve here. Physical damage and/or theft of the covered rental vehicle. 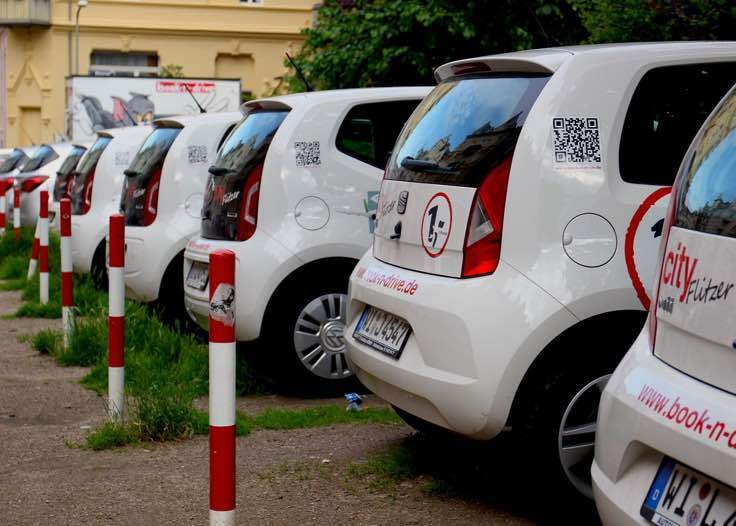 Valid loss-of-use charges assessed by the rental company while the damaged vehicle is being repaired and is not available for use, as substantiated in the company’s fleet utilization log. Reasonable and customary towing charges related to a covered loss to take the vehicle to the nearest qualified repair facility. As you can see in point #2 above, the loss-of-use only applies to records which are substantiated in the company’s fleet utilization log. This seems completely reasonable to me – and I’d think a car rental company would have to prove actual damages if they decide to try and collect for “loss of use” — but note the paragraph above about being caught in the crossfire during this dispute. Everything we’ve discussed above covers damage to the vehicle itself and any “loss of use.” What about harm to other people and property? Most states require a minimum amount of liability insurance. It’s the one part that typically isn’t optional. Worse, there is no theoretical cap on damages. If you injure an emergency room doctor and you’re at fault, it’s going to be expensive. The same is true if you destroy a Tesla. As someone looking to protect his or her wealth, you’ll want at least enough liability coverage to protect whatever amount of net worth you’re comfortable losing. Liability insurance up to the mandatory state limits is usually included automatically in the rental coverage (since the law requires it). But even if the car rental company is required to provide the minimum amount of liability insurance, it’s likely to be a lower number. Here’s a list of the minimum liability insurance required for all 50 states. As you can see, coverage is often only up to $50K for the entire accident. If you have a $500,000 net worth and cause $200K in damage, the insurance will pick up the initial $50K, but you’ll be left to pick up the remaining $150K yourself. In California, I recently learned that car rental companies are not required to provide the minimum liability protection required by state law (see Hertz’s statement here). This means it’s entirely possible to walk out of the rental agency without any liability coverage and immediately be in violation of the law as soon as you put the keys in the ignition. If the car rental company is asking you for your auto insurance company name, that should give you pause that they’re entering the data into their computers because they’re expecting that insurance policy to provide the liability protection (I found it mystifying that I’ve successfully rented several cars in California, declined liability coverage and then driven the car off the lot – all before I knew of this unique circumstance). And here’s another critical point: None of the credit card companies provide liability insurance. If you have personal auto insurance, you’ll have liability insurance baked into the agreement up to your policy limit. State Required Mandatory Minimum (although not always required, see the California discussion above). Liability Insurance (or supplemental liability insurance) purchased from a car rental agency. As discussed above, the state required mandatory minimum is a low amount that could only protect you up to $50,000 of damages. You’ll be on the hook for everything above the state minimum. A non-owner car insurance policy is unfamiliar to the vast majority of the population, mainly since most people own cars. This policy is specifically for people who do not own cars. A non-owner car insurance policy is liability coverage. It’s not going to cover any damage to the borrowed or rented vehicle. Bodily Injury and Property Damage Liability cover damage to people or property caused by me. The Uninsured Motorist policy protects me if an uninsured motorist causes harm to me or my property. And, in New York, the Medical Payments coverage pays for medical, dental and funeral expenses for anyone riding in your vehicle, regardless of who is at fault. In other words, this is a secondary health insurance policy. It also covers you for medical payments needed if you’re hit as a pedestrian. For health insurance, I rely on my employer-provided health insurance (although, there are health insurance options if you’re early retired or self-employed). My employer also provides a group disability insurance policy that is adequate for my purposes at the moment (although I’m actively looking into purchasing disability insurance). I rely on American Express’s premium car rental protection to cover damage to the car, but you could count on any credit card’s property coverage policy that makes sense to you. I own a non-owners insurance policy from USAA to protect myself from damage to other people or property. My policy costs approximately $250 every six months. Is it cheaper than buying liability insurance from a car rental company? No. Liability insurance from a car rental company costs between $10 – $20 a day. For the math to work out, I’d need to rent a car more than 33 days each year. But there are four reasons why I choose to purchase non-owners car insurance rather than relying on a rental car company’s liability policy. First, I like the consistency of knowing who is providing my liability coverage and the amounts of coverage. Rather than relying on the rental car company to get it right and to cover me in a sufficient amount, I prefer taking things into my own hands. Second, my non-owners insurance policy covers me for uninsured motorists. It’s not at all clear to me that rental car liability insurance has this coverage. Sure, the credit card should cover the damage to the car but what if I can’t work or need to make medical payments because an uninsured motorist injured me? While I have health and disability insurance that should kick in, this would cover those deductibles which is a nice bonus. Third, my non-owners insurance policy covers medical payments if I’m injured as a pedestrian. Again, I have health insurance and disability insurance to cover this as well, but it’s a bonus of having my own policy that the deductibles on those policies would be covered. Fourth, I wanted an umbrella policy. It’s pretty tricky and maybe impossible to get an umbrella policy unless you have auto and renters/homeowner insurance. Understandably, umbrella policies are written to cover liability after the primary coverage has been breached. That’s why umbrella policies are so cheap. Buying a non-owners car insurance policy is what allowed me to purchase an umbrella policy. So there you have it. That’s how I protect myself when I rent a car. It’s amazingly complex for what seems like such a simple thing, but cars are liability generating machines! Let’s talk about it. Protecting yourself from liability can feel like playing a game of whack-a-mole, and I’m continually learning. How are you protecting yourself from the risks associated with owning and operating a vehicle? This post was so incredibly enlightening! I had no idea my credit cards provided coverage for rental car damage and loss of use. After reading your article, I combed through all of my credit card policies to review what’s covered and what isn’t. AMEX is by far the best: $50,000 coverage for damage and loss of use. Discover recently cancelled its Auto Rental Insurance, effective February 28, 2018, for all of its credit cards. 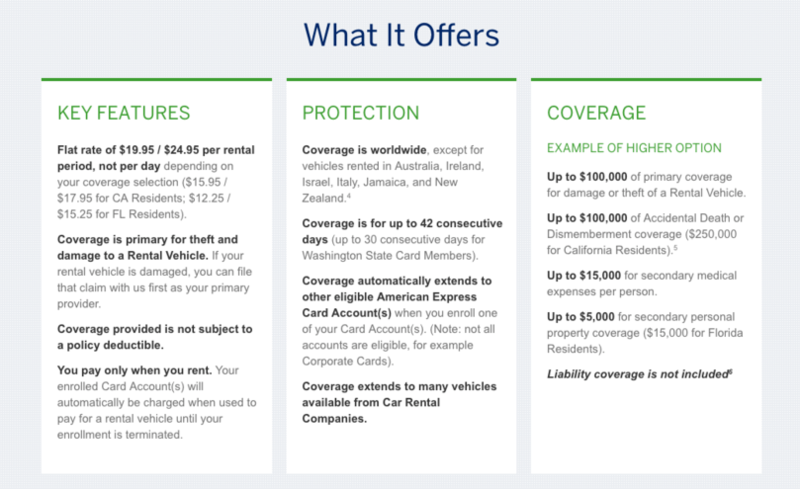 Prior to being cancelled, Discover used to offer up to $25,000 in coverage for Damage or Loss to a Rented Automobile (not including Loss of Use). My Capital One Visa Signature covers Damage or Loss to a Rented Automobile as well as Loss of Use, “up to the actual cash value of most rental vehicles”. Full policy can be found here: https://www.capitalone.com/assets/credit-cards/pdf/visa-signature-guide-to-benefits-revised.pdf. In all, this was a lot of fun learning that my credits cards provide more benefits than I even realized. Thank you again for bringing my attention to these awesome perks. Thanks for the comment Amber! I also appreciate you letting everyone know about Discover and Capital One’s programs. I am sure others will find that helpful. The only thing thing to keep in mind is whether those policies extend to international rentals. If you’re renting a car abroad (or in one of the US territories), I’d double-check before the trip to make sure that you’re covered. Those credit card perks are worth it though! One other suggestion – write this down in your Investment Policy Statement. I have one page devoted to my insurance coverage and it’s helpful every time this comes up, since I typically forget in between car rentals. I find that the additional add ons are how the rental companies make most of their money. Nowadays I don’t really rent a car unless I’m in a new country and out in the countryside. Uber works just fine. You should try Juno. We’ve been using it in NYC for a while now as a replacement for Uber. Good point though. We’ve taken entire vacations without renting a car, relying on ride-sharing services to get us to and from all destinations. Sometimes you don’t even need to rent a car! This is just one anecdote, but it convinced me to buy the rental company’s best insurance every time. I needed a rental car for a weekend and was in the market for a nice SUV, so I rented a really nice SUV for the weekend. I had signed up for American Express’ premium car rental coverage for $25 per rental and paid for this rental with my AmEx Platinum card. Since it was an expensive vehicle, I also bought Hertz’s Protect the Car coverage. While my car was parked outside my uncle’s house on a ranch in the middle of nowhere in Texas, someone backed into the front of it with her big Texas truck. It did a lot of damage to the bumper, grill, headlights and left front side. It was all pretty much cosmetic damage, but I knew it would be expensive to fix. I called American Express first and went through their system that never recognizes my voice but eventually got through to a human. She started listing off all the information I needed, including a police report. I said I would get back to them and called Hertz. The Hertz person answered the phone quickly, but the first thing out of his mouth was, “Are you okay? Is anyone hurt?” Only after making sure everyone was okay did they let me start telling them what happened. They really wanted to send someone with a different rental car to me, but I insisted that it was still drivable. I gave them the other driver’s name, address, and insurance information. I dropped the car off the next day and never heard another word from them. I assume they got their money from the other driver, but it was a wonderfully pain-free experience from my end. After that, I dropped AmEx’s premium rental car coverage and always get the rental company’s best coverage. I also don’t rent a car unless I absolutely have to, so it’s not a huge amount of money. As a sidenote, I ended up buying a much smaller and cheaper SUV. Thanks for the story, Matthew. Glad you got out of that experience pain-free and without any financial losses! I’m surprised that Hertz didn’t require you to file a police report either but haven’t had any experience with that myself, so maybe Hertz is able to take care of everything sans police report (which sounds super convenient). The main concern I’d have with relying on the car rental company’s policy is that (i) I’d have to read each company’s CDW/LDW coverage each time to make sure I understood it and (ii) it would be significantly more expensive than AmEx’s $19.99/$24.95 coverage. Do you exclusively rent with Hertz to eliminate that first problem? Car rental companies will jump at any opportunity to get some extra bucks. Thank you for going into such details. Wonderful read! Car rental are struggling with over regulation and competing with under regulated services like Uber. AAMCAR.com is the last cheap rental car place in New York. Thanks for mentioning AAMCAR. I wasn’t aware of it. Agreed that the cheap rental car places in New York seem to be disappearing. Now I seem to only be able to find the big brand names. Thank you for this knowledgeable post. Most people face the problem of car damage, and I’ve really gotten the sense of why this happens. But a good friend of mine once told me that when he hires a car, he is so reckless the reason being ‘the car doesn’t belong to him’ and doesn’t care what happens to him. Health insurance and disability insurance should not be a thing for discussion. Everyone ought to have those two insurances.